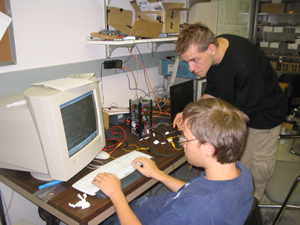 Illinois Observing Nanosatellite (ION) - Launches July 26, 2006!! The Illinois Observing Nanosatellite (ION) is the first project of the Illinois Tiny Satellite Initiative (ITSI), which is organized through an interdisciplinary senior design course. 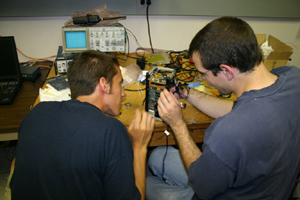 The course objectives include training students to identify, formulate, and solve engineering problems as part of a large multi-team project. As the University of Illinois' first student-developed satellite, ION has been completed and awaits launch in the near future. Ham Radio Operators: Listen for ION's beacon, report a contact, get a QSL! 4/12/06 The countdown has begun! Over the past five years, over 125 students across seven engineering disciplines have contributed to the project. Most students participate in their senior year with some starting earlier or participating as graduate students. One to two graduate Teaching Assistants provide day-to-day program management and continuity across semesters as the students in the course continually change. In addition, three faculty advisors provide mentorship and numerous other faculty provide technical support as required. Typically, five to six teams of three to five people each participate in the project. Other ITSI projects include the primary payload for the Thunderstorm Effects in Space Technology Nanosatellite (TEST) and a successor to ION (temporarily named ION-2) that began one year ago. In addition to the primary educational mission that CubeSat programs perform, the University of Illinois has strived to also demonstrate the utility of these tiny satellites by following through on real missions including a science mission. The ION team hopes that the resulting product will help expand the perceptions of what these tiny satellites can do someday leading to future space sensor webs. The first of ION's missions involves measuring Oxygen airglow emissions from the Earth’s mesosphere. This helps scientists understand how energy transfers across large regions contributing to our knowledge of atmospheric dynamics. Second, ION tests a new MicroVacuum Arc Thruster (µVAT) with high dynamic range advancing a key enabling technology for small satellites. This serves as a stepping-stone towards a versatile low mass satellite propulsion system capable of lateral movement and finely controlling attitude. Such a capability might someday allow greater interaction with other spacecraft. Third, ION tests a new SID processor board designed specifically for small satellites in Low Earth Orbits (LEO). By utilizing a Commercial Off the Shelf (COTS) processor that is radiation hardened through system design techniques, it allows small satellites to take advantage of the latest in small, low power, high performance processor technology with increased reliability. 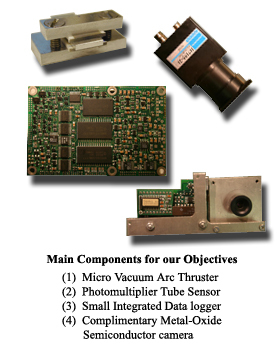 Fourth, ION tests small CMOS camera for Earth imaging on this and future spacecraft. Finally, ION performs ground based attitude stabilization demonstrating an important capability for the future growth of CubeSats. ION’s design includes solar cell power point tracking, dual redundant batteries, a custom communications protocol, a custom file system, automatic telemetry publication to the Web, and future support for distributed ground stations. ION’s primary mission consists of measuring molecular Oxygen airglow emissions from the Earth’s mesosphere using a 760nm photometer. Oxygen chemistry at this 90km altitude emits a dim glow of light, and ION’s photometer should show perturbations in this airglow caused by various effects such as the presence of mountains. These perturbations ripple through the atmosphere in 15km to >2500km waves carried by wind. By studying these waves, scientists learn how energy transfers across large spatial regions contributing to knowledge of upper atmospheric dynamics. This airglow emission is absorbed by the Earth’s lower atmosphere preventing study with Earth-based sensors, and satellite detection has the added benefit of global coverage. In addition, ION’s orbit gives it a unique opportunity to gather this data around the Polar Regions and at higher latitudes. At a date in the near future (check News/Update posts above), ION will be put into a polar orbit around the earth by the Russian DNEPR-1 launch vehicle with a space head module. An interesting fact about the previous purpose of this launch vehicle is that it used to be a Russian, liquid-fuelled SS-18 ICBM. It is modified by replacing the payload compartment with a space head module to create the DNEPR-1 launch vehicle. When in orbit, it's orbit allows for two periods of communication, one at 12:00pm and another 12:00am for a total communication time of about 45 minutes. ION sensory information and PMT data will be downloaded using a ground station at the University of Illinois. Orbital maneuvers and operational timetables will be uploaded during our communication period. ION is designed to operate for six months, at which time the batteries will wear out and radiation will erode the electronic components. After about 10 years, ION's orbit will decay, and it will burn up in the atmosphere. So far, some 100 organizations have registered intentions to develop CubeSats, and about a dozen have launched. Success rates have been surprisingly high considering that these satellites are developed by inexperienced students often as the first spacecraft from their institutions. The CubeSat Spec, developed by Stanford and Cal-Poly Universities, standardizes the mechanical interface between CubeSats and their PPOD deployers. This allows developers to efficiently combine multiple CubeSats and include them as secondary payloads with ongoing launches. CubeSats typically have a mass of one kilogram with dimensions of 10x10x10cm, and they can be combined into double or triple CubeSats to create a larger satellite. Three CubeSats fit into deployers called PPODs developed by Cal-Poly University. They then mount multiple PPODs onto a launch vehicle as secondary payloads. The CubeSat spec specifically minimizes risk to the rest of the launch vehicle and payloads. For example, switches at the bottom of each satellite’s feet turn off all electronics while the satellite waits for deployment in the PPOD, and the PPOD completely encloses the CubeSats. The satellites also go through vibration, thermal-vacuum, and bake out procedures prior to launch.